Bishop Innokenty of Ussuri, a vicar of the Vladivostok diocese, visited the Democratic People’s Republic of Korea from October 9 through 16 at the invitation of the DPRK Orthodox Committee and the Orthodox parish in Pyongyang. The visit was timed to the 65th anniversary of the establishment of diplomatic relations between Russia and the DPRK. During the last days of his visit, Bishop Innokenty, accompanied by archpriest Alexiy Sabansky, priests of the Pyongyang parish and members of the delegation from the Vladivostok diocese, visited the city of Wonsan and Kimgansan (Diamond Mountains). The guests visited places of interest and walked to the waterfalls in the mountains. Prayer service was celebrated at the sightseeing platform in honour of the Intercession of the Most Holy Mother of God. Orthodox service was celebrated here for the first time in the history of the presence of the Russian Orthodox Church in the DRRK. On October 12 and 13, Bishop Innokenty officiated at the All-Night Vigil and the Divine Liturgy celebrated at the Trinity church in Pyongyang together with archpriest Aleksiy Sabansky and the two Korean priests. Ambassador Alexander Timonin of the Russian Federation to the DRRK, chairman of the DPRK Orthodox Committee, Kim Chi Son, and members of the diplomatic representation of Russia. The delegation of the Vladivostok diocese visited the memorial cemetery of Pyongyang. Bishop Innokenty celebrated requiem litiya for the Russian compatriots, website of the Vladivostok diocese reports. The parish of the Life-Giving Trinity in Pyongyang, consecrated in 2006, is under canonical jurisdiction of His Holiness Patriarch Kirill of Moscow and All Russia. 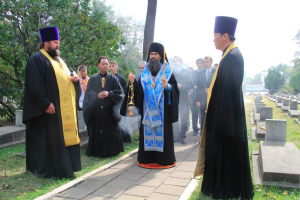 Upon his blessing, the Vladivostok diocese helps Orthodox priests in Korea with their ministry.